Skill Level - Previous experience in handbuilding and/or throwing recommended but not required. 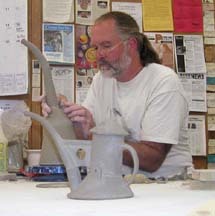 Vince Pitelka is back again at Studio 540 this summer with another information packed workshop. Vince is an excellent presenter, and so open and sharing with his knowledge. You really will want to participate in this one! And it is all happening in the beautiful Sierra Nevada Foothills town of Nevada City!